Hershey Felder channels Leonard Bernstein in “Maestro” at the Old Globe. 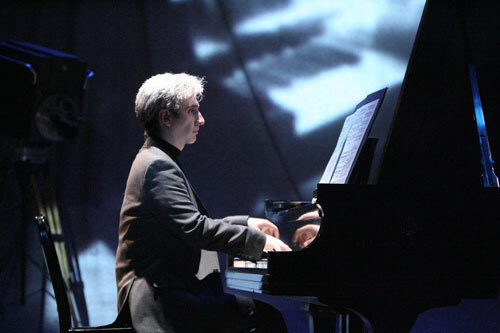 First off, Hershey Felder as Leonard Bernstein is fantastic. Alone on stage for nearly two hours, he tells stories, he sings, he imitates dialects and body language and he plays piano wonderfully. In all these respects, his performance is outstanding. The music is beautiful and the anecdotes are interesting and occasionally amusing. But does the play provide a satisfactory understanding of Bernstein the man? Not really. To be fair, the limitations are in the title: “The Art of Leonard Bernstein.” This wasn’t intended to be a grand exploration of Bernstein, but rather a focused attempt to apprehend the music he produced, as well as the music he admired. However, it’s obvious that Felder, who also wrote the book, recognized the need to address key aspects of Bernstein’s life. Still, these recognitions are fleeting at best and generate more questions than answers. The show revolves around Bernstein’s recollections of how he rose to be such a great musical auteur—and there’s no doubt he recognizes his own greatness. He plays pieces of compositions, his own and those of the greats, and explains various aspects of the music, pedantically at times. There are a series of men who inspire him: his father, various contemporary composers and conductors, Beethoven. Felder performs each one (well, not Beethoven) with singular passion, rendering their accents and mannerisms quite convincingly. But the ultimate effect is a series of grouchy old men who, for the most part, instantly recognize Bernstein’s genius and take him under their collective wing. You would think that, at least musically, he never experienced a setback. The elephants in the room are Bernstein’s sexuality and his Jewish faith. The latter is dealt with reasonably well, especially in the descriptions of his devout father. There is one indirect reference to anti-Semitism, when one conductor suggests that he anglicize his name. Did Bernstein ever personally experience real anti-Semitism? One would presume so, but there’s no evidence of it in the story. His homosexuality is more problematic. There are a couple of vague hints, but the focus is music. Later, the subject is broached more honestly, but there is no attempt to link these struggles with his art. Coming so late in the show, it seems like an afterthought and the descriptions of his marriage veer dangerously close to melodrama. The production is quite good. The show uses old stills and video quite nicely. The set is suitable, with a Steinway grand, lights and a 1960s vintage television camera. The lighting is effective and unobtrusive. The direction by Joel Zwick is a bit frenetic at times but works. Ultimately, when viewed through a very narrow lens, “Maestro: The Art of Leonard Bernstein” is well done. If you are interested in seeing the show to hear snippets of beautiful music soundly performed, I encourage you to go. If, on the other hand, you wish to learn more than superficial tidbits about Bernstein’s life, I’m sure you can find an excellent biography on Amazon.